Greenwood Village, CO – The newest franchisee of Maui Wowi Hawaiian in Clarksville, Tennessee is beginning his “second life” after retiring from a 22 year career as a military police officer with the 501st Signal Battalion, 101st Airborne Division at Fort Campbell, KY.
Transitioning from the structured Army lifestyle, Gary Cryder is going from one family to another as he begins his business and brings the Aloha lifestyle to his community. “Being in the military for 22 years, it’s pretty easy for us to follow a program because that’s what we do day in and day out. 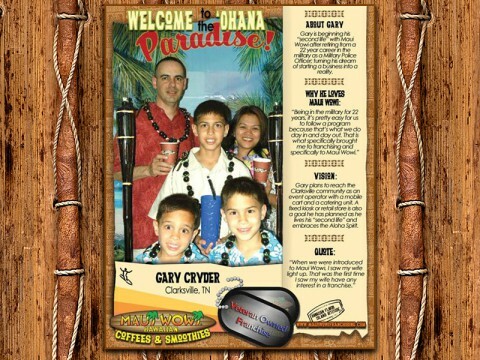 That is what specifically brought me to franchising and specifically to Maui Wowi,” said Cryder. He and his family spent 6 years soaking up the culture in Hawaii while he was stationed on the island of Oahu. After returning to the mainland, he carried those memories with him as well as the dream of one day owning a business. Now that the time is right, those two elements have collided, bringing him to his “second life” as a Maui Wowi franchisee. “When we were introduced to Maui Wowi, I saw my wife light up. That was the first time I saw my wife have any interest in a franchise,” said Cryder. Cryder holds a degree in business management and now has the solid platform of leadership experience from the military to assist him in building a successful business with the support of a proven system. 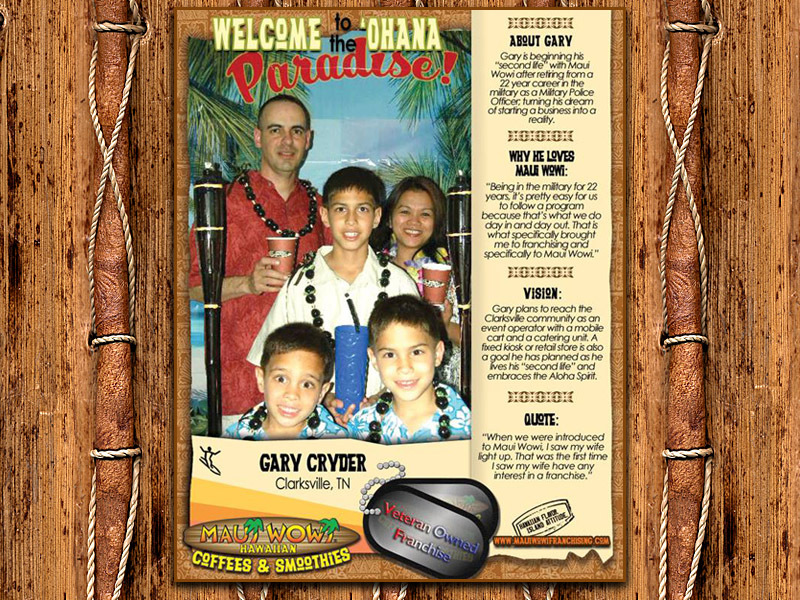 The Maui Wowi franchise culture is very family oriented, often referring to other franchisees as members of the ‘ohana. Cryder has embraced a similar lifestyle and plans to continue helping his fellow veterans and bring his new business to events on base in Clarksville, which he describes as having a large population of active and retired military. Cryder also plans to hire veterans as employees. He will start out with one of Maui Wowi’s most popular business models, a mobile unit called the Ka’anapali Cart. The transportable unit can be rolled into events and venues to serve freshly blended fruit smoothies and smooth tasting Hawaiian coffees. With so many opportunities in the area to work events, Cryder already has a long list that he has been gathering and he is ready to dive in. Transitioning from his tight knit group in the military to the Maui Wowi ‘ohana will give him the support and guidance he needs to fulfill his dream and reach his goals one smoothie at a time. For more information, you can visit Maui Wowi of Clarksville’s facebook page or call 931.538.9937. 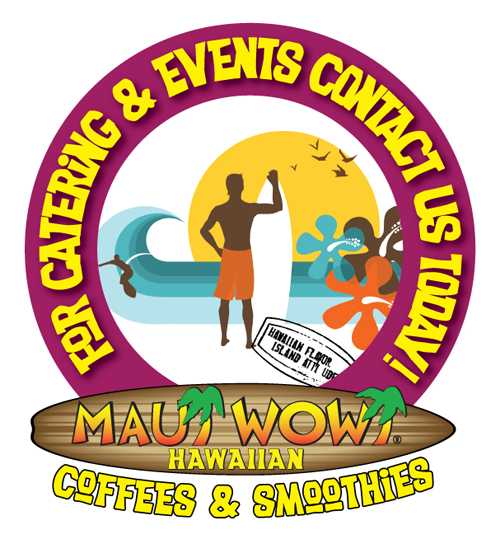 Since 1982, Maui Wowi Hawaiian has embraced the Hawaiian culture and has been serving paradise in a cup since the day it began, 30 years ago. From event carts, mall kiosks and stand-alone retail locations Maui Wowi Hawaiian offers premium, all-natural, gluten-free, fresh-fruit smoothies, as well as gourmet Hawaiian coffees and espresso beverages. With over 400 operating units in eight countries, Maui Wowi Hawaiian has truly gone “Global” by adding an online store, shop.mauiwowi.com. Now customers from anywhere in the world can experience the prized-gourmet Hawaiian coffees and taste the ‘Aloha Spirit’ with a ‘Click-of-a button!’ To learn more information about Maui Wowi Hawaiian’s, products, locations, or flexible, low cost franchising opportunities, visit http://www.mauiwowifranchise.com.